Probably, some people consider orchids a special subject in gardening and difficult to cultivate compared to other plants growing indoors. However, caring for some orchid types, such as Phalaenopsis (especially) and some other genera, doesn’t require any additional efforts compared to most house plants, and such orchids could be a good solution for beginners. Some of the other orchid genera may be more demanding in growing requirements, but everyone can learn how to cultivate them properly. In this topic, we discuss general rules of growing and looking after orchids at home. When we wonder how to look after orchids, first of all, we should keep in mind that almost all indoor orchids grow in tropic woods in nature, and most of them are epiphytic. This, probably, is their main prominent feature. In woods, they are usually attached to trees, but they are not parasites. Their roots are able to absorb rain water, dew, even air moisture and the nutrients from plant debris and dust. 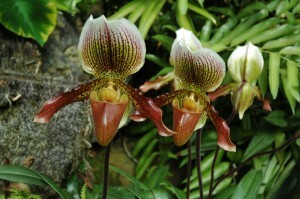 There are two main types of orchids. Orchid plants of the first type produce new growth every year from the basal part of a plant. This new growth has its own roots and blossoms, and then initiates the next growth. Such plants consist of several stems rising from a special creeping stem – rhizome. Another type is characterized by the single main stem growing up during every year and producing new leaves on its top, but making no new growth from the basal part. The rhizome is absent, the flower stems and the roots are appearing serially from the stem between leaves. The first type, producing annual stems from a rhizome, is called sympodial. The type with one main stem is called monopodial. 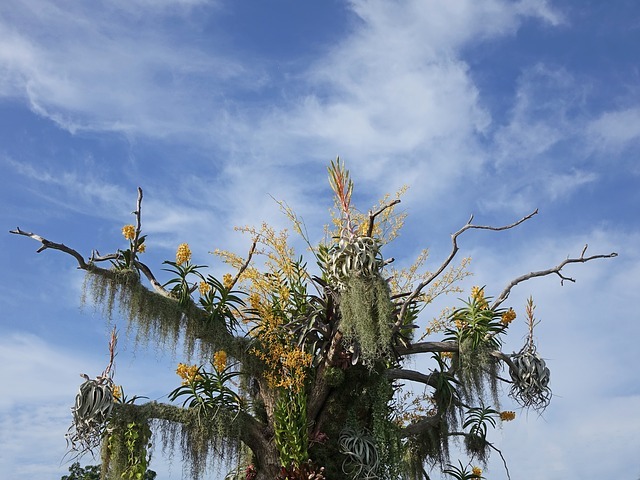 There are much more sympodial orchids than monopodial ones; Dendrobium, Oncidium, Paphiopedilum, Phragmipedium, Cattleya, Cymbidium, Bulbophyllum, Peristeria and many others are typical sympodials. Sympodials are characterized by having so-called psedobulbes, storing water and nutritions for an unfavourable dry period. All orchids having pseudobulbs can do without water for a certain period of dormancy, but in most cases, it is better to reduce watering at this period, rather than completely stop it. The growth periodicity is the typical characteristic of sympodial orchids. Different sympodial orchids may differ in care significantly. Monopodial epiphytic orchids usually have thick fleshy leaves, this trait makes them more tolerable to dry periods even if they have no pseudobulbs and no dormancy. Phalaenopsis, Vanda, Angraecum and Vanilla are monopodial orchids. All indoor orchids are photosynthetic organisms, as a result they cannot live without light that gives them energy to build carbohydrates. If light requirements are not provided, the plant becomes more susceptible to diseases and finally dies. In addition, many orchids won’t bloom if they experience the lack of light. Orchids are diverse plants – some of them grow under the full sun (Aerides, terete-leaved Vandas, Brassavola, most Cattleya species) and require high amount of light, but some (such as Jewel orchids and most Paphiopedilum species) grow in lower forest levels and don’t require much sun. So, you should consider the species you’re growing, as different types of orchids require different levels of light, and you should consider where you grow them. If you have a greenhouse or southern windows with full sun and grow sun-loving orchids, you will only worry about some additional light in short winter days. “warm” – night temperature of 15-180C (60-65°F) (Phalaenopsis , Oncidium, Vanda, phalaenopsis-type Dendrobium, Asian-type Cymbidiums, Grammatophyllum, Dendrochilum, Vanilla). Of course, it’s a very rough scheme, for example, some orchids need even cooler conditions in winter, besides different species and hybrids of the same genera may vary a lot in their requirements. The majority of orchids grown indoors are epiphytic plants. Probably, this is the main and most prominent difference between orchids and most house plants, although there are other epiphytic indoor plants. In spite of the existence of different ways of orchid culture, the most common way of growing orchids at home is growing them in pots. Choosing a proper substrate is very important if we are growing orchids in pots. We remember that most orchids growing indoors are epiphytic. They have to be grown in substrates which mimic their natural growing conditions. There are a lot of different substrates for epiphytic orchids. The examples of these include bark, epiweb, perlite, osmunda root, cocoa chips, sphagnum moss, clay pellets, tree fern, vermiculite and more. How to choose a proper one from all of that? One of the most important characteristics of potting medium is its water capacity, or how long the substrate can stay wet. For example, bark is not so much water-holding as sphagnum moss. As a result, it’s recommended in sphagnum moss grow only orchids that don’t like to stay dry even for a short time, instead bark suits most orchids as a good type of substrate. 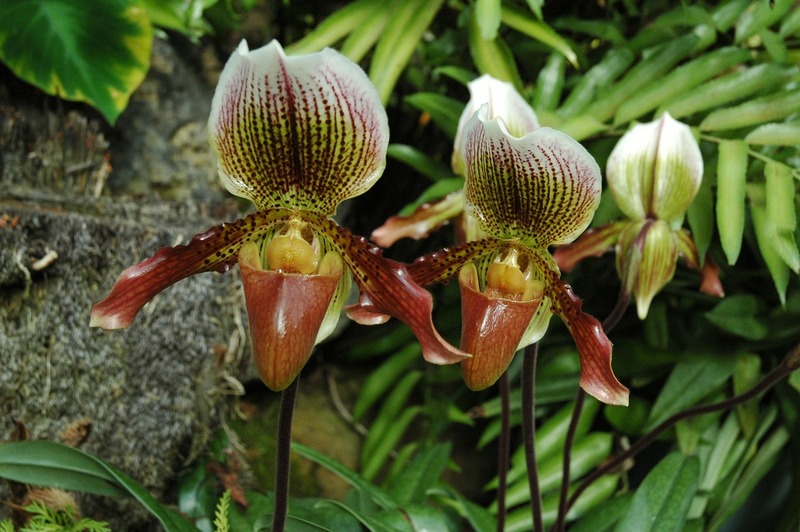 Also, there are so-called calcicolous orchids (for example, quite a few species of Paphiopedilum), which usually grow on rocks in native conditions; such plants are known as lithophytes. You should add some chalk, limestone or other calciferous materials to a potting mixture for such orchids. 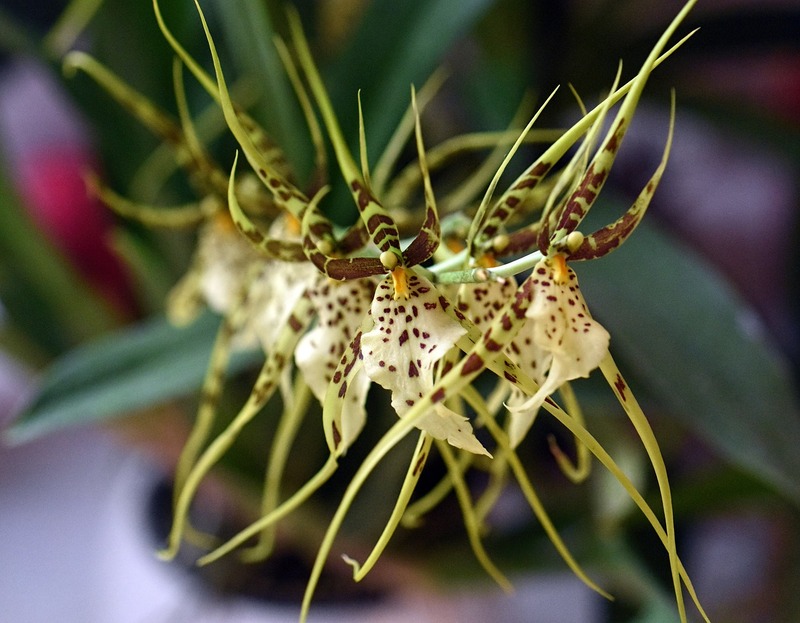 There are quite a few terrestrial orchids as well (for example, Phaius, Pleione, Bletilla, all Jewel orchids, some Paphiopedilums and others), which have to be grown in pots with soil like most house plants. Both ceramic and plastic pots can be used for orchid potting. It’s better when pots for orchids have ventilation holes. One of the disadvantages of ceramic is that orchid roots tend to adhere to the sides of ceramic pots; this will be a serious problem when you’re repotting your orchids. To repot an orchid plant that grew in such pots, you often need to crack the pot, or damage plant’s root system, which isn’t good, of course. So it’s better to keep orchids in plastic, and if you want your orchids to look more attractive, you can just put a plastic pot into a ceramic one. Also, plastic pots keep moisture longer than ceramic ones. It is better to water a plant with sufficiently thin water jet to provide all substrate surface moistening. New bark does not keep the water well. This continues until the decay process starts as a result of bacterium activities. In general, the watering frequency depends on many circumstances: different types of orchids require different rates of watering, small pots are drying faster than big ones; drying is faster under warm than under cool conditions and, of course, dry air causes faster drying than humid one. It is useful to sort the plants by size and conditions for watering. Also, the state of the plant defines the water consumption: resting plants require less water than active plants. How often an orchid should be watered also depends on the potting medium and the size of the pot. The water being supplied should contain low salt concentration – distilled or boiled. For most orchids, but not for all, water must have a slightly acidic reaction, pH =6.2; to prepare the water with pH 6.2 you can add about 1/4 teaspoon of a vinegar to a gallon of pure water. In order to check pH of the water, you can use a pH meter. Generally, orchids like high air humidity and may suffer from dry air. However, most of the modern hybrids are less fussy. Increasing of the air humidity by spraying of the plants cannot be recommended in most cases. First of all, this acts a very short time, and more importantly, the water affecting with the leaves inspires fungus and bacterial diseases. The water staying in the growth point or in the leaf axils of such orchids as Phalaenopsis, Paphiopendilums, Miltonias and some others is of especial danger. In order to keep the appropriate level of air humidity you can use room humidifiers or humidity trays. To check the temperature and humidity of the air you can use hydro-thermometers. A very important thing in orchid care is correct usage of orchid fertilizers. Like other plants, all orchids grow better when they are supplied well with all the nutrients they need. You should keep orchids away from drafty areas, but often good air movement is extremely important for correct orchid culture. Also, you should avoid relocation of orchids too often. Don’t place orchids which are not blooming yet into a room which has no windows or artificial lighting systems. Without sufficient lighting, flower buds won’t develop appropriately. In these types of conditions, you can place only plants with fully-opened flowers. If your climate is not frosty, you can keep orchids in a garden outdoors all year round. 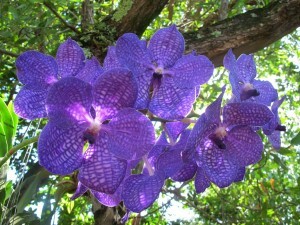 Orchids are rather resistant plants to diseases and pests. Healthy and properly cared orchid plant is highly resistant to most pathogens except viruses and bacteria, which are highly contagious and can easily break plant resistance. Viruses are practically incurable and therefore an infected plant should be eliminated from the collection to save other plants. Bacterial diseases are highly contagious and rapidly kill the plant, so any sign of bacterial soft rotting should alarm you – you have only days and hours to save the plant by removing infected parts and applying disinfectant. Fungal infections are regularly caused by poor growing conditions because properly cared orchid is rather resistant to such diseases. Overwatering, improper temperatures and insufficient light are the main causes of fungal infection. After identification of fungal infection, you should remove infected plant tissues, apply a systemic fungicide and reconsider growing conditions your orchid plants stay in. Making repotting in proper time is very important in orchid care. When to repot an orchid? You should consider two main factors – the quality of the substrate that you grow the orchid in, and the biological cycle of the orchid. Usually, sympodial orchids may be propagated by simple division of the plant, Vanilla can be easily propagated by cutting off the steam. Phalaenopsis can be propagated by keikis, which can form from generative buds. Different orchids bloom at different time of the year, and you can assemble a collection of orchids, where orchids will be blooming one after another all year round. Usually, flowering lasts for about a month, but this time may significantly differ among different species. Also, there are such types of orchids which can bloom for all year almost without interruptions. That is not a secret, that orchids are grown for their showy flowers (except Jewel orchids). It is very frequently asked – will orchid rebloom after flowering? What is a proper way of looking after orchids after flowering? How to get an orchid to bloom? Many people don’t bother at all and simply use orchids as some sort of a live bouquet and discard faded orchids, sometimes because they don’t know what to do with orchids after orchids’ blooms fall off. But it is better to keep the plant and rebloom it, as orchids are perennial plants, capable of growing for centuries. Orchid care after flowering is different within different types of orchids. For instance Phalaenopsis hybrids don’t need special care after flowering at all, just continue to water it, give an orchid light, fertilizers and warm, and eventually, it will rebloom again – some hybrids are actually ever blooming. Sympodial orchids bloom from new pseudobulbs, so to rebloom them you have to make orchid from mature pseudobulbs. Usually, care differs for different species, but it is a good idea to reduce watering a little and wait until new growth is visible. Some orchids (such as Catasetum) have a very strict dormancy after blooming, and watering must not be applied at this period. When a new growth is visible, you have to increase watering and start using fertilizers with high nitrogen content. When a new bulb is clearly visible, it is a good idea to switch to balanced fertilizer, because at this stage nitrogen inhibits bud formation and could even break a plant’s life cycle and kill it. When pseudobulb became juicy, potassium and phosphorus fertilizers should be applied to stimulate buds formation. 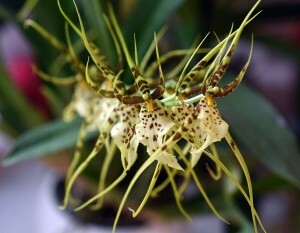 Some orchids need cool or intermediate dormancy to stimulate flowers formation, for instance, some Dendrobiums won’t flower at all if they aren’t provided with such conditions, and their flowers instead would be keikis if temperatures are too high. So, orchids are very diverse and beautiful plants. For proper orchid care, first of all, you should know what specific type of orchid you’re growing, because orchids may tremendously differ in growing requirements. It is important to remember that most of the orchids in stores are artificial hybrids which are more adaptive to growing in home conditions than the majority of wild species. People enjoy orchid flowers, and looking after orchid plants itself may be an enjoyable action if you don’t mind a little gardening and love these marvelous creatures.